While I gave up sodas long ago, I still miss them when eating a few things … like pizza or steamed crabs. I knew we’d be having steamed crabs the other evening and I decided to make a frozen “slushie”-type beverage as a healthier substitute. Lemon-Lime Coconut Basil Slushie. I remembered a recipe that I’d seen in the May issue of Better Homes and Gardens magazine—Lemon Basil Ice made with Meyer lemons. However, that recipe took almost 5 hours to make—yikes! I wanted something I could whip up fairly quickly. Plus, I didn’t have any Meyer lemons available. I also wanted a beverage that had a little more slush than ice, so I decided to include some lite coconut milk versus just water. And, I wanted to use my new Boyajian citrus oils, namely the lemon and lime oils, that I’d received as a birthday gift. Today’s recipe for Lemon-Lime Coconut Basil Slushie or Lemon-Lime Coconut Basil Ice Cream—your choice, or make both!—is what I came up with. It’s ideal as a slushie to sip while picking crabs or just chilling on the screened porch or deck, but also wonderful as a spoonable ice cream! This combination of lemon, lime, coconut, and basil is so cooling and refreshing. You can sip it, eat it with a spoon, or do a little of both! In large bowl or blender, add lemon oil, lime oil, lemon juice, lime juice, “basil water,” coconut milk, honey, and stevia. Use hand mixer or blender to blend. Add to pre-frozen container of ice cream maker. Churn 15 – 30 minutes. Yes, that’s a wide gap of time. Check at 15 minutes to see if the mixture has reached your desired consistency. I really wanted a beverage to sip with my steamed crabs more than a scoopable snow cone like mix, so I was pleased with the consistency at 15 minutes for that purpose. However, I churned the mixture for the full 25 or 30 minutes, and perhaps additional freezing afterwards, might be needed for a firmer ice dessert. Again, I mainly wanted a beverage, so even at churning the full time, I let most of the ice get “melty” and then sipped it as a beverage. Very light and refreshing. You can use any sweetener as I stated above, but honey always yields a softer, more scoopable frozen dessert, so I recommend using at least some honey. I used fresh lemon and lime juice; I’m sure that bottled would work, but it would not be quite as flavorful. The lemon and lime oil should not be used with plastic measuring spoons; the oil ate right through the plastic. Next time, I’ll remember to use my stainless steel measuring spoons, which are much better to use anyway. The basil flavoring in this mix is very mild. If you want a stronger basil flavor, steep basil in water for 30 minutes. Finally, if you read the ingredients of lite coconut milk, you'll see that they are water and coconut milk (and maybe guar gum depending on the brand). The lite coconut milk costs the same amount as the full-fat coconut milk at my store. Why not just buy full-fat coconut milk and add filtered water to make your own lite coconut milk? As soon as I open a can of coconut milk, I transfer it to a glass jar immediately anyway. So now, if I want a lighter coconut milk, I just use a bigger jar and add filtered water. It works great. p.s. If you have so much basil that you don’t know what to do with it all, follow Kalyn’s (Kalyn’s Kitchen) directions on freezing fresh basil. It sure would be nice to have some basil in sauces and soups in the middle of winter! Read and see Kalyn’s guidance here. « Adopt a Gluten-Free Blogger for August … I’m Hosting! That ice sounds SO refreshing….. I can’t wait til I can get a freezer that works so I can try it! Thanks for the link! In the comments is quite the chemistry analysis of why Kiva’s flax bread recipe works so well!! And WOW I see that I must jump on this basil-and-lemon bandwagon! Your ice/ice cream looks fantastic and sounds so, so refreshing. Yum! Thanks, too, for mentioning the ebook. I’m very excited for it–I mean, it’s ALL dessert! 😉 I must go check out Susan’s documentary as well, plus at least 10 of those other links you mention! Hi Ricki–Thanks! Glad to help you with blog reading management. 😉 I think you’d really like the basil and lemon combo. Very light, but luscious. Can’t wait to see the new e-book! I predict that it will be very popular. 🙂 Susan’s documentary is excellent; I’m sure you’ll enjoy it. Thanks for linking to my post about Danna’s latest book! When I read the forward from Fasano I did a double take – I could not believe the number was even high than I’d read before. Yes – it’s a good time to be gluten-free in the U.S. Finally!!! Thank you so much for giving me to shout-outs here! You are awesome! I really really appreciate it! This ice looks so delicious! Those flavors go so well together. I recently made Nancy’s (Sensitive Pantry) Lemon Basil Ice Cream and it was the most refreshing treat! Now I will have to try this one. After all, my boys cannot complain about basil if they are getting it in a treat like this! 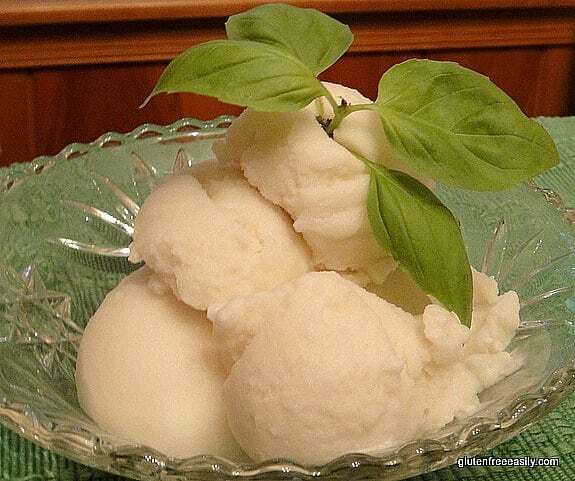 I still plan to try lemon basil ice cream. I’ve enjoyed it before, but have never made it. It’s one of those flavors that really surprises you, isn’t it? I don’t think your boys will complain at all. Let me know. That looks so delicious. I love the glass you used and the garnishes. It makes me want some right now. I don’t like soda very much, but like you I sometimes want one with certain foods like pizza. Sounds refreshing! Thanks for linking up – stumbled! I agree with everyone – what a great post !! It’s amazing: you’ve detailed so much great information in there, as always. 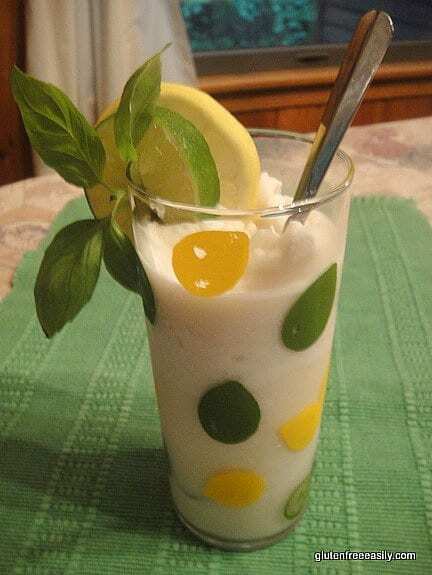 Your lemon basil delight looks absolutely fabulous. This one goes on the short list for sure. Thanks so very much for the lovely mention. That was so kind of you. Hi Stephanie!–So great to see you. 🙂 Thanks very much for the kind words. It’s rewarding to know that folks find these newsy posts of value. What a refreshing treat, and as always, you are a wealth of gluten-free information. Now I’m off to check out some of these links you shared. Thanks for the shout out, Shirley! This ice/drink/smoothie looks amazing! You know how I love my frozen treats! Hey Kim–My pleasure! 🙂 Actually I think you included a link to my site the other day (for the gfe-unique giveaway I think) … not sure if thanked you. If not, thanks! Hi Aubree–You honor me so when you include my gfe recipes! 🙂 Now I must go check out the other entries … last week was awesome! Love your weekly Top 10! What an ode to these lovely GF bloggers!! I all checked them out! Your coconut & basil lemon & lime ice looks great & sp tasty too! That smoothy looks refreshing too! MMMMMMMMM,…I also made your GF flat & firm cornbread & your banana & maple nut muffins & these 2 recipes were divine!! It all tasted superb!! Hi Sophie!–How terrific that you’ve been following the links and checking out some new bloggers!